The Shoppes At Beacon Light is a vibrant, upscale community-oriented shopping center located in the tony waterfront enclave of Lighthouse Point. 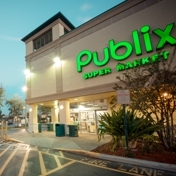 The well-manicured center is the upscale retail choice in the area, with a locally-flavored tenant environment including nearly 100,000 square feet of prestigious retail space anchored by Publix Supermarkets, the premier grocery store in Florida. With nearly 50 tenant opportunities available from basic services to unique shopping, the Shoppes At Beacon Light provides a wide selection of services and products to its many customers. The structural, architectural and aesthetic design of the center, together with excellent interior visibility, combine to emphasize convenience for the customer, facilitate cross-shopping, and promote multi-store purchases within each customer visit, resulting in additional sales volume not otherwise achieved. The Shoppes At Beacon Light is truly the economically vibrant shopping alternative in the area. Lighthouse Point, directly on Federal Hwy and Lighthouse Point Drive.